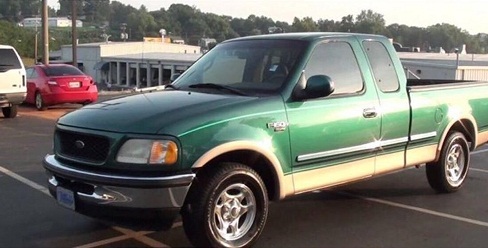 The Pickens County Sheriff’s Office is currently investigating the theft of a 1998 Ford F-150 truck (green & tan in color) from the Spinx Station on Moorefield Memorial Hwy in Liberty. The incident which occurred on Wednesday, February 15th, at approximately 7:20pm was captured on the store’s video surveillance system. An adult W/M, wearing dark colored overalls, a ball cap and tan colored boots can be seen inside the store before exiting and disappearing from the view of the camera. Moments later, the same man is seen walking up to the truck while carrying what is believed to be a backpack and what appears to be a case for a musical instrument. 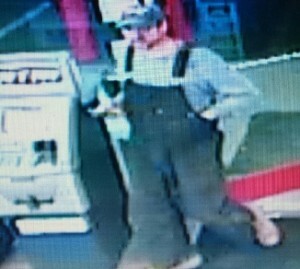 The unidentified male enters the truck and can be seen driving away from the Spinx while the owner of the vehicle is still inside the store. I have attached two images taken from the video that show the unidentified male believed to be the suspect in this case along with the actual photo of the stolen truck. At the time of the theft, the truck was displaying South Carolina License plate LQU759. Detectives are asking anyone with information as to the identity of the man seen in the photo or the whereabouts of the stolen vehicle to please contact the Pickens County Sheriff’s Office at (864) 898-5500 or Crimestoppers at 1-888-CRIMESC. Sheriff Rick Clark will be leading an effort this week to address excessive litter thrown on Pickens County highways. The Sheriff’s Office is partnering with other agencies from local branches of government on February 14 -16, to fight the unsightly litter that has been thrown from vehicles that travel Pickens County roadways. Sentenced inmates assigned to work crews from the Pickens County Prison and the Pickens County Roads & Bridges Department will be tasked with working alongside members from the local SCDOT Office to collect trash on US123 from the city limits of Easley to the city limits of Clemson. “This is a cooperative effort between several entities to include county inmate litter crews supervised by staff from the Pickens County Roads & Bridges Department as well as the Pickens County Prison. The SC Highway Patrol will also be assisting in the monitoring of traffic on US 123 during which time the speed limit will be strictly enforced. Digital information boards will be posted during the event to educate and remind drivers to slow down and watch for litter crews. The public is being asked to honor a maximum speed limit of 55MPH while this work zone is in effect. Crews will be deployed during the hours of 8:00am to 5:00pm during the three day initiative. Sheriff Rick Clark and representatives from the above noted agencies will be available for interviews at 9:00am on Tuesday, February 14, 2017, at a staging area located on US 123 just beyond the Hwy 93 bridge traveling towards Clemson from Easley. As a final request, Sheriff Rick Clark is encouraging individuals, groups or other organizations to consider participation in the “Adopt a Highway” program. Additional Information can be obtained by contacting Palmetto Pride at 1-(877) PAL-PRDE (725-7733) or http://palmettopride.org/ or http://palmettopride.org/pickup/adopt-a-highway/. Palmetto pride coordinates with your local SCDOT office.